It is quite common for visitors and tourist to have an overnight stop over in Nairobi while in transit to other destinations. Nairobi International Airport remains an important transit for travelers to East Africa and Middle East being the biggest airport in East and Central Africa. Nairobi’s international Airport is called Jomo Kenyatta International Airport (JKIA) and it is about 18 kilometers from the city center. It is about 25 minutes drive when there is no traffic. We offer private airport transfer services to Nairobi hotels 24 hours a day, 7 days in a week. Furthermore, you will only pay after our courteous, English speaking drive has checked you in at the Nairobi hotel. 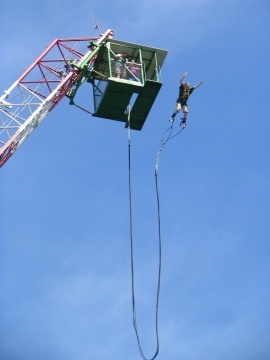 Bungee jumping is an extreme sport and it involves jumping from a tall structure while being held around your torso using a body harness. When the person jumps, the cord stretches and the jumper flies upwards again as the code snaps back, and continues to oscillate up and down until all the energy is dissipated. In Kenya bungee jumping is done at Tana River near Sagana. A steel tower erected on the banks of the river provides a 60 meters (196 feet) platform from where the plunge is done. Sagana is 98 km from Nairobi on the Nyeri road. Fountain Safaris can provide a tour van to the site or you can self-drive to Sagana. Kenya has gained reputation as a new golf destination for enthusiasts around the world. Kenya won IAGTO’s Award for the Best Undiscovered Golf Destination of the year 2009. Endowed with a pleasant weather all year round, Kenya offers a variety of setting from the cool highlands of Mount Kenya Safari Club to the coast of Mombasa at Leisure Lodge Beach Hotel & Golf Resort. Some of the courses have close proximity to the city center, while others provide a reclusive environment away for the bustle and hustle of the major cities. The Kenya Open held at Muthaiga Golf Club is the most prestigious golfing event in Kenya, part of the PGA European Challenge Tour.